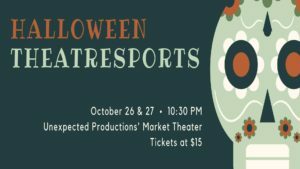 Seattle Theatresports celebrates the season of ghost, ghouls, and costumes with a special Halloween weekend run. Join our popular weekly, high-stakes, competitive improv comedy show for some laughs and new memories. Based on Your spooky suggestions, two teams of improvisers rumble, creating exciting fast-paced improv games, hilarious stories, scenes, and songs right on the spot and in the moment. BOO the judges as they award points to each team. Maybe you will win the best suggestion?